Speaking of the technology of the future, let’s talk a little bit about universal remote controls. No, they may not control the universe themselves, but they can change your life for the better. No more flipping through multiple clickers in hopes they will change your volume or channel, enter a new device that can combine all those clickers into one. Not to mention, some even come with a touch screen device to help simplify your life, especially for those who may have a harder time adjusting to new technology. To help you get going on buying your own universal remote control, check out our buying guide and top 10 of 2107, below! Before purchasing your universal remote control, there are a few things you should take into consideration. Ease of Use: The point of having a universal remote is to make your life simpler, not more complicated. Look for a remote that is easy to use. Certain remotes have features that make use even easier like touch screens, voice commands, and programmable options. Compatibility: Your remote should be able to control more than just your television. All universal remotes should be able to control your tv, cable box, DVD player, and sound system. Some of the newer remotes can also control smart appliances in your home, like your thermostat or refrigerator. Mainly, your remote should be able to control every device you want it to. Options for Connectivity: There are a few ways that a remote can control and connect with a device. The most common is infrared, or IR. This is also the least expensive, however, you can only control devices within the line of sight. Radio frequency remotes can operate devices without a line of sight, but they are not compatible with as many devices as IR. Nowadays, remotes can also connect over WiFi. However, these remotes can only connect to devices on the network. Mobile Devices: There are apps that can turn your smartphone or tablet into a universal remote. To do this, however, you may need to purchase an IR blaster attachment for your phone. Display: As mentioned above, some remotes feature touch screens or display screens. These screens can display messages and make the overall use of your remote easier. This also allows for greater customization for your set-up. 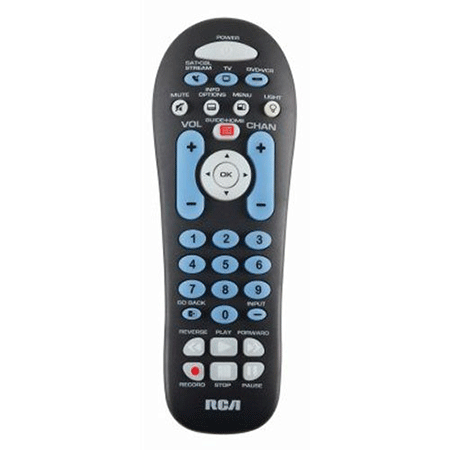 This extremely affordable universal remote control by RCA is both functional and dependable. Built of a durable plastic shell, it can last for years of use. The key layout in the design is simple to use and offers a backlit keyboard. In addition, the device only requires 2 AA batteries which can last for months at a time. RCA also offers a lifetime warranty with the device in case it ever breaks or malfunctions. 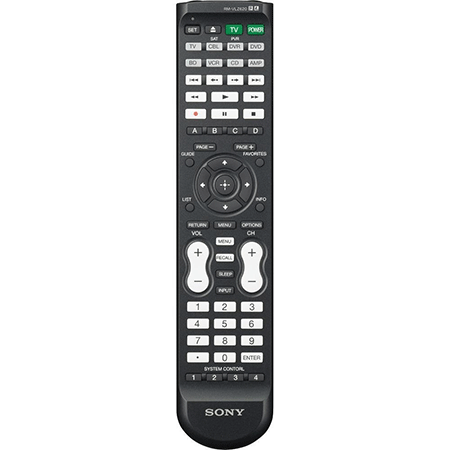 The Sony RMVZ220 universal remote can control a variety of different TV components in one simple to use device. In it’s addition to the featured backward compatibility with most major brands. It is an affordable device, with an easy to learn interface. Also, the device offers a DVD and TV feature for easy switching to and from. One of the best touchscreen universal remotes on the market is the Logitech Harmony all in one remote. The device sports an use a touchscreen with an array of different customization features. With the ability to control up to 15 different devices and support of over 225,000 devices, this universal remote is a no-brainer buy for any household. In addition, Logitech also offers an “expert setup” option for those new to this type of technology. The Logitech Harmony 350 has the capacity to replace up to 8 of your devices and roll them into one simple to use remote control. With an easy to view and use layout, the interface is easy to understand, and flipping through your favorite channels has never been easier to do. Plus, setting up the device only takes minutes to complete. Sony’s RMVLZ620 universal remote control is a unique device that offers a simple to use design with learning buttons built in to make it easier to use. The remote can control up to 8 different devices including your DVD, TV, and VCR. In addition, it has a great battery life that can last for months before needing to recharge or change. 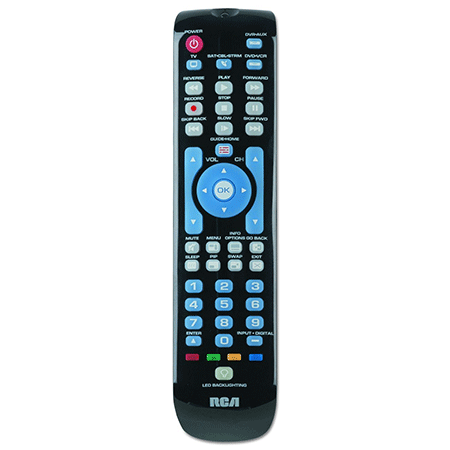 The RCA RCRN04GZ 4 Device Universal Remote can support up to four different devices and can support most major brands of appliances. It can be used to control TV, SAT, CBL, DTC, DVD, and VCR. Setup is simple with automatic code search. Additionally, the remote features an ergonomic, thin design and includes backlighting. If you use Apple TV, Roku, Media Center, or Xbox One in your home, this remote should be at the top of your list. The Inteset INT-422 comes pre-programmed to work with all of these devices. The remote is backlit, which makes nighttime use much easier. One of the best features of this remote is its macro-programming functionality. This means that you can program a string of commands, making use much easier. 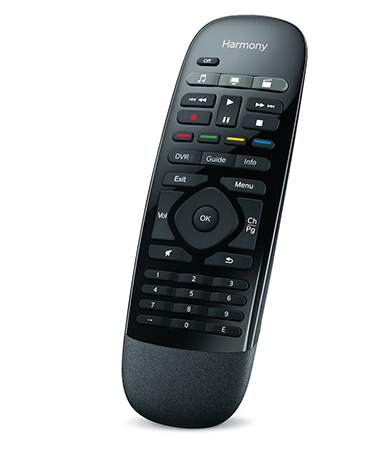 The Logitech Harmony Smart Control remote is a convenient and easy to use replacement for all of your remotes. You can control up to eight devices with the smartphone app or by using the remote. 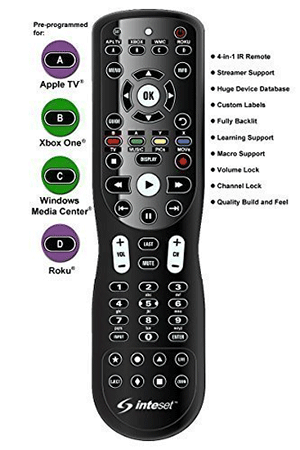 This remote is compatible with over 270,000 devices including Apple TV, Roku, Xbox One, and more. Plus, with the Harmony hub, you can control devices that are located in cabinets or behind walls. 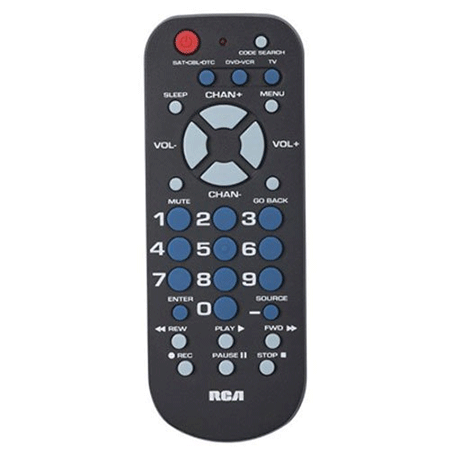 If you are looking for a universal remote without all the frills, the RCA RCR503BZ is the one for you. This device can support up to three devices and is fairly simple to set-up. The buttons are easy to read and color-coded for basic use. Additionally, the remote is compact and small, which makes it very easy to hold and operate. The best universal remote control you can purchase in 2018 is the Logitech Harmony 650. This remote features very intuitive controls.. The remote features one-touch buttons for common activities, like “Watch a Movie.” The Logitech Harmony 650 also has an easy to read display screen that makes navigation even easier. It can support up to eight different devices and is compatible with over 225,000 devices. Universal remote controls can provide an easy to use and comfortable piece of technology to work for the average household. Especially with your TV, VCR, DVD, etc. only being a click away, it is a perfect choice for those who need a simpler fix to managing all your devices. However, even if you would rather flip through a dozen of remotes to find the one you’re looking for, a universal remote control can save you hassle and stress in the long run. Hopefully, this guide could help you choose the best universal remote for your home and help narrow down your shopping list.